v Will LS1M work on my car? v What if I already have a Palm? Will it work on mine? v Can I use a laptop instead of a Palm? v Can I mount it to my dash? v How much does it cost? v Are there any group discounts? v How fast does it scan? v What about software updates? v Can I export logs to Excel or EFILive? v How do I order one? v Where can I get a serial hotsynch cable for my Palm? Will LS1M work on my car? 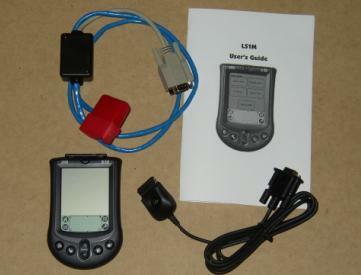 LS1M uses the VPW protocol for OBD2. This protocol is the one GM has used for its cars & trucks since 1996. All GM vehicles from 1996 to present should work. To verify that your car has OBD2, look for the OBD2 connector. 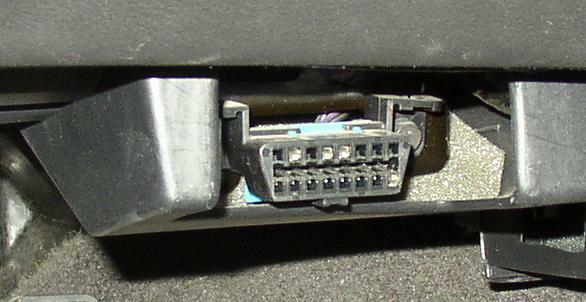 It’s a 16-pin D-shaped connector, usually located under the dash. Pins 2, 4, 5 & 16 must be present (they should have a metal piece in them). Pins are numbered 1-8 across the top & 9-16 across the bottom, left to right. What if I already have a Palm? LS1M has been successfully run on many different Palm models. If you have a Palm m100, m105, IIIxe or IIIc, then you should be good to go. These models come with a serial hotsync cable that plugs right into the LS1M cable. If you have another Palm model like the m125 or m500 series or one of the newer Tungsten models, check the hardware specs and make sure it has a serial port. You will also need to purchase a serial interface cable (almost all new PDA’s come with only a usb cable, which won’t work) with a Female DB9 connector on it. These are available from http://www.palmone.com or http://www.pdaparts.com or other online stores. You can also check ebay. If you have a Handspring Visor or any other non-Palm brand PDA, the OBD-2 interface cable may need to be modified to make it work. This is due to the Visor and other models having an unpowered RS232 port. Email for more details. Can I use a laptop instead of a Palm? Right-click on the link above & save it to a folder on your computer. Then double-click to install. Once it’s been installed and you run it off the Start menu, you’ll have to right-click the screen & go to Install -> Database…, then browse to find the ls1m.prc file. Click the Home button a few times until you can see the LS1M icon. Right-click again & select Settings -> Communication -> Communication Ports. Click on Cradle at the top, then Edit, then change the “Bound To” value to match your computer’s com port number. After that’s all done, you can right-click again, go to Storage -> Save… and save a snapshot file that you can load next time. The other thing you will need is a null-modem adapter and possibly a gender changer. Your laptop’s serial port is a 9-pin D-shaped male connector. The LS1M obd2 cable is also a 9-pin D-shaped male connector. To get these two to talk, you have to put in a female-to-female adapter on the laptop, then a null-modem adapter. The null-modem adapter is necessary because the laptop transmits & receives on different pins than the Palm does. Both the adapter and gender changer are available at Radio Shack or other electronics supply house for a modest fee, usually $5 or so. Can I mount it to my dash? 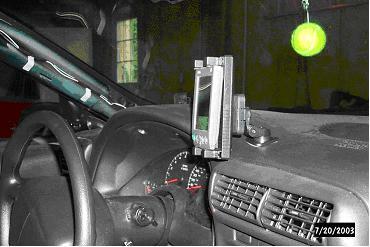 There are a couple of options available for mounting the Palm in the car. One is to use a Belkin folding hot-synch cradle & attach it to the car with a bracket (picture on the left). These cradles are available occasionally on EBay. There are also commercially available PDA holders (picture on the right). The particular one in this picture is from Arkon (http://www.arkon.com/palm2.html), model CM228. See the pricing schedule at the left. 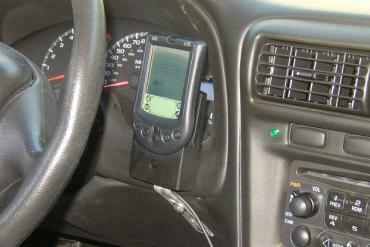 The full package includes everything you need to plug in and start scanning: a Palm handheld computer with batteries and stylus, a hot-synch cable, an OBD-2 interface cable, software disk and instructions. When available, a hotsynch cradle will also be included for use with your PC. The software disk contains Palm Desktop, which is a program you use on your desktop computer to back-up the data on the Palm and install new programs, as well as extract logged data from the Palm. Other documentation is also included on the CD. How fast does it scan? Testing on LS1 cars has shown a scan rate of 330-350mS for 10 parameters (30 parameters per second), down to 50-70mS for a single parameter (20 times a second). The fewer parameters you select, the faster the scan time is. During wide-open-throttle (WOT), the response time is about 20% slower because the car’s computer is busy and doesn’t respond as quickly to scan tool requests. LS1M was designed for simplicity. Anyone can be up and running with it in 5 minutes. The user’s guide that comes with LS1M will take you through the Palm basics and show you how to plug in & run the program. If you can read this, you can use a Palm, which is much simpler than a computer. Updates to the LS1M program happen continuously and are free to all LS1M customers. Installing the new version over the old one is as easy as installing any third-party application on a Palm, using the Palm Desktop program. Just copy it to your PC, add it to your Palm Desktop, and hot-synch. Users are emailed about updates as they are available, and can be downloaded on the download page. To see if you are already running the current version, click the “About” button on the scanner & note the version number. Can I export logs to Excel or EFILive? You simply select the log you want to save to the PC, and pick a location for the file. 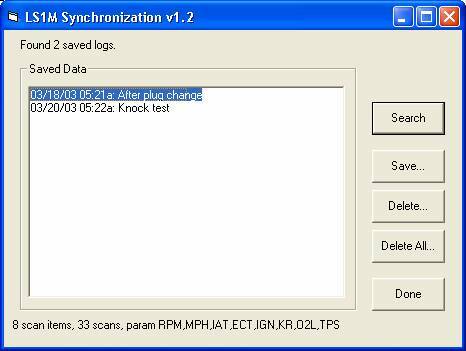 The LS1M Synchronizer is available on the download page, and is also included on the LS1M Software CD. EFILive is another scan tool that uses another cable design, but the efilive program itself is a free download, available at www.efilive.com. On the Pricing page, there’s a button you can just click to order via Paypal. Please include your mailing address for shipping, and specify all the options from the Pricing page (at left). Packages usually ship out the next business day after the order was received. Allow 2-3 days for US shipping, and a little longer for international orders. There is a new installation routine for the LS1M Synchronizer available on the Download page that should alleviate this problem. This message indicates that the LS1M program can’t talk to the OBD2 interface cable. First, double-check all connections, and make sure the car is running or has the key in the “run” position. Check the fuse that powers up the OBD2 connector in the car, which is usually the same one that powers up the cigarette lighter. If you have access to a volt-ohm meter, check for 12 volts between pins 4 & 16 on the car’s OBD2 connector (as you look at the connector from the driver’s seat, pins are numbered 1-8 across the top & 9-16 across the bottom, left to right). Using the same hotsynch cable (not the cradle), perform a hotsynch on the computer to make sure the Palm’s serial port is OK. You can also try a fresh set of batteries in the Palm. If all else fails, email for more help. Many Palm model PDA’s have serial ports, but only include a USB hotsynch cable. To use a PDA with LS1M, you must have a serial hotsynch cable with a Female DB9 connector on it. To purchase one for your PDA, visit http://www.palmone.com/us/products/accessories/ or other internet sites like http://www.pdaparts.com or maybe ebay. If you can’t find one, make sure that your model supports it. There’s a list of PDA specifications at http://www.palmone.com/us/products/handhelds/. USB to Serial adapters are not recommended.